The Jointmaker Pro v2 holds a custom Japanese saw blade rigid and straight while your clamped wood is pushed through the blade to make the cut. With everything held securely, the resulting cut is perfectly straight and extraordinarily clean. Primarily made of anodized aluminum. The gears are nylon. This is a perfect application for nylon gears. There is no backlash and it is a low-load and low-rpm mechanism. The Fences are Trap Jaws and are made of Poplar. They are consumable items and replacements are available to order or you can make your own. The JMpv2 Jointmaker Pro comes with 3 Crosscut A blades. Blades which are made in Japan specifically for this saw. The Crosscut A (28 tpi) is the most commonly used blade. We use it 90% of the time. It has a kerf of 0.016”. A stop block is included which allows you to accurately set the depth of cut. Accessory Blades (Crosscut B; Crosscut C and the Rip Blade) are available. The JMP is assembled. The dimensions of the JMPv2 is 28" x 16" x 12" tall. It weighs 37 pounds. NOTE: Due to the size of the JMP, it can only be shipped UPS or Fed EX. USPS will not ship this product. JMP Jointmaker Pro v2. Trap fences. Straight fence. 3 Type A crosscut blades. Blade Height Stop. Owner's Manual. What is the Jointmaker Pro? The Jointmaker Pro is nothing more than an adjustable back saw in a frame. Rather than the blade moving forward and backward as is typical with every handsaw in the world, it is held in place and the stock, rigidly attached to linear tables, is moved over the top of the blade. The angle of attack is adjustable based upon the either the thickness of the material, the width of the material or the hardness of the material, or any combination of the three. What makes the Jointmaker Pro so unusual is that it is a handsaw that is cutting from the bottom up. What kind of blade is used in the Jointmaker Pro? If you were to take the blade and put it in a hand saw, it would work just like a dozuki crosscut pull saw. The blade is one of the finest crosscut saws made on this planet, it is patented and each tooth has four separate grinds with 28 teeth per inch. How are the teeth set on the Jointmaker Pro blades? Each tooth is set (bent) in alternate directions. This creates a kerf (the gap in the wood made by the cut) that is wider than the body of the saw. At the factory, the saw blade passes under a small hammer that is actuated by a cam. The downward force of this hammer is determined by gravity. On the first pass every other tooth is smacked by the hammer and “set”. The blade is then flipped, and passed through the same machine and hammer which sets the opposite teeth. It is surprisingly consistent and accurate. What does saw pitch mean? On the standard Jointmaker Pro crosscut blade there are approximately 320 teeth. The blade protrudes through the top of the tables at an angle-the rear of the blade is higher than the front. This is the pitch of the blade and it is adjustable. The amount of material removed by each saw tooth is identical for every tooth so the pitch needs to be changed depending upon how many teeth are engaged simultaneously (the width of the board), or the hardness of the wood. We want the blade to do the work without stress and that is accomplished by changing the pitch of the blade. What is the ideal pitch of the Jointmaker Pro blade? The ideal pitch is one where the chip load per tooth makes each pass seem almost effortless. You really should never feel the saw cutting, nor should the table be difficult on the push stroke. For example, if you were going to cut a ½” diameter dowel in half, you could pitch the rear of the blade so it was slightly higher than ½” inch and cut the dowel in a single pass. Simple math tells us that if we divide .5 inches by the number of teeth (320) we get a chip load of 0.0015”. That means each tooth removed exactly one and one half thousandths of an inch of material. At the major diameter (1/2”) and with 28 teeth per inch, we have 14 teeth engaged simultaneously with a combined chip load of approximately 0.020”. Now lets examine a board that is 3” wide, same material as the dowel for comparison sake. Each pass, will expose the board to 84 teeth cutting simultaneously. If we used the same 0.0015” chip load as the dowel, the rear of the blade would be approximately 1/8” above the tables for the first cut. However, it may, or may not, feel like a lot of effort is required to make a pass. If so, the pitch should be adjusted downward. Remember, let the saw do the work. The ideal pitch is where the saw is doing the work with very little effort per pass. How high to I raise the blade between passes? You always raise the blade the same height as the correct pitch. Using the example above, with a pitch of 1/8”, you would want to raise the blade 1/8” per pass. 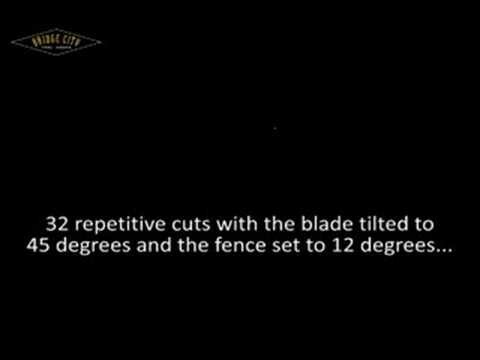 That means that you would raise the blade somewhere between one and two full two revolutions depending upon how effortless the cut “feels”. Less effort is always better. What happens if I guess the wrong pitch at the beginning? The worse thing that can happen is you get your material stuck on the blade because the pitch was too aggressive. You may, or may not have ruined the blade. But when this does happen do not attempt to retract the stock by moving the tables backwards. Try lowering the blade directly out of the cut. This prevents kinking the blade which is not good. The very best practice is to start with a pitch that is too low and gradually increase it to an optimal pitch. How important is work holding? critical when the blade is tilted. If the stock move upward while the blade is tilted, you will almost always jam your stock on the blade. Not good. What factors can contribute to a cut that is not accurate? Faster and more is the least effective way to use the Jointmaker Pro. Let the saw do the work! If you try to aggressively cut really hard woods, the saw blade will try it’s best to find the path of least resistance and drift in that direction. Hard woods require many more passes than softer material. That is OK! Making passes on the Jointmaker Pro can be relaxing if you know that your patience will be rewarded with the results you expect. It is the biggest mistake made using the JMP. You cannot over restrain your stock. Make sure it cannot move. Towards that objective, it is recommended that you adhere 150 grit sand paper to all of the wooden fences and trap clamps. Once the last tooth of the blade passes the stock adjacent to the fence, it is time to retract the tables so the stock is now over the first couple of teeth. There is no need to push the tables until they crash into the rear and front plates on each pass. Your stock should be over the saw blade at all times, never off of the saw blade. In other words, you do not want the kerf to find the saw blade at the beginning of each cut, nor find it coming backwards. Stay on the blade, that is why there is a lead in and lead out area on the blade with no teeth. With proper setups the JMP blade will last for a surprising long time. But if you bend a tooth or two, or break a tooth, or kink the blade, the saw will cut but may not cut accurately. Save these blades for those cuts that are not mission critical. Is the keel tightened fore and aft? Are you sure your setup is as illustrated above? Think twice, and cut once. If all of the above does not rectify inaccurate cuts, then we want to know about it. It is likely something wrong with the unit. How should I properly align the JMP Black Saw Guide? What is the proper keel set-up? What is the clearance required so the saw blade is not interfered with during cutting? I’m having difficulty cutting a straight line. My board is well clamped and wedged so it cannot move. 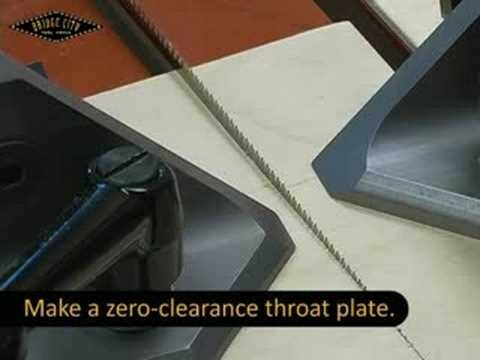 I’m certain the blade is referencing 45 degrees to the table. The blade is quite new and I’ve clamped the saw to my workbench so it cannot move. I’m only advancing the blade 1/3 revolution after each cut, being careful not to force the blade. What do I need to do in order to be able to cut a straight line? First, do you have an accurate fixed reference for 45 degrees? The questioned is asked because you are relying on a static setup to yield a dynamic result. Adjust the saw so the cut fits light tight in your fixed reference. This is the only way to get the results you need for gallery quality cuts. If you do not have an accurate fixed reference for 45 degrees, then the second-best choice is to make two cuts and check them using an accurate 90 degree square. The bottom line here is, it doesn’t matter what the static setup indicates, it matters what the cut indicates. Simply make adjustments so the cut reflects your intent. When properly setup (clamped and checked with an accurate reference), your saw will produce accurate cuts. Are you positive that the FIXED saw guide is dead planar with the saw blade? Are you positive that the saw blade (keel assembly) is dead parallel to the travel of your tables? The kerf in the fence needs to be 3 or 4 times the thickness of the blade. 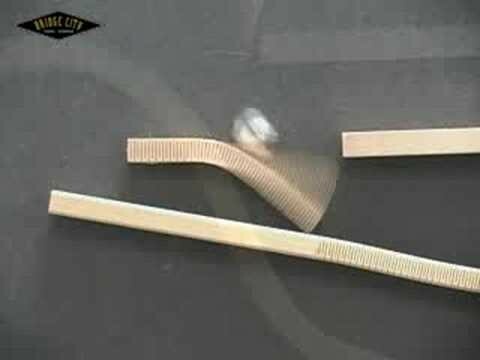 If it is not, then all of your adjustments will be meaningless because the saw blade will align itself to that inaccurate kerf, bend the blade and no matter what you do, the cut will be crooked. All of my fences have pre-cut kerfs that are about 1/8” thick. This is an FYI, but all mitered cross cuts should be cut with trap clamps fore and aft. It is now possible to obtain—regardless of skill level—professional quality cuts without the need for hearing protection, dust collection or electricity. And the resulting cuts (unbelievable until you see it for yourself) require no further clean-up--no need for shooting boards or plane and chisel work. The Jointmaker Pro v2 (patented) is a hybrid device, a hand saw that employs custom Japanese saw blades offered in crosscut and rip grinds. The blade quickly attaches to a spine which is part of the blade adjustment carriage. 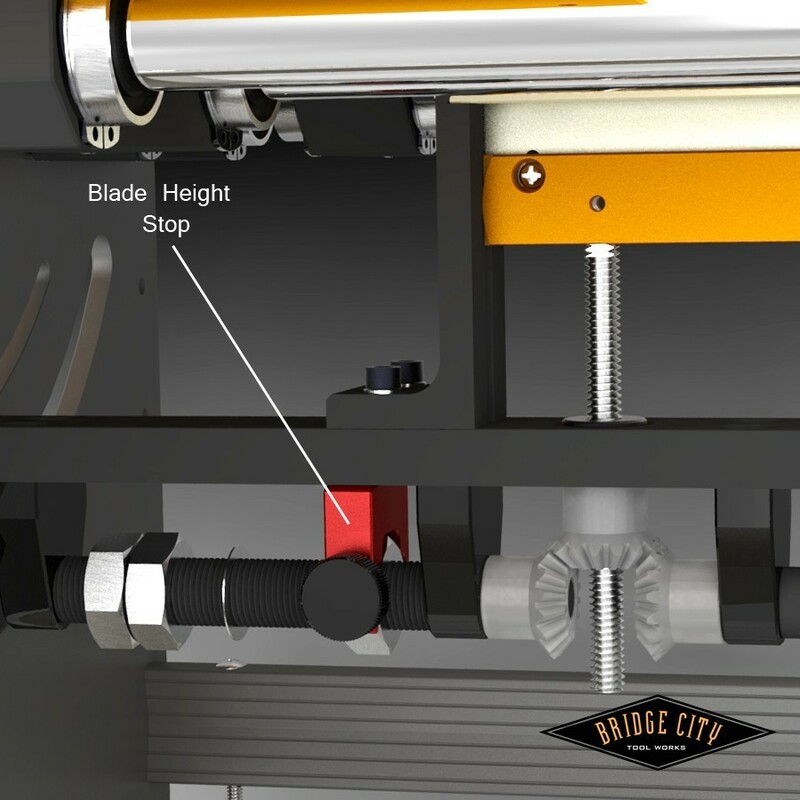 The blade moves up and down via a hand-crank on the front of the machine and features an independent pitch adjustor. This combination allows for perfect crosscuts up to six inches in width and in material up to 1-3/4” thick. Small cross-sections like small moldings and dowels can be cut in one pass; the size of larger cross-sections and the hardness of wood will determine the number of passes for a through cut. In either case, the cut is unbelievably smooth and true. The kerf is only .016”— it is phenomenally efficient. It comes with 3-Crosscut A blades. Traditionally, wood is held in a vise or clamped to a bench and then cut with a handsaw. 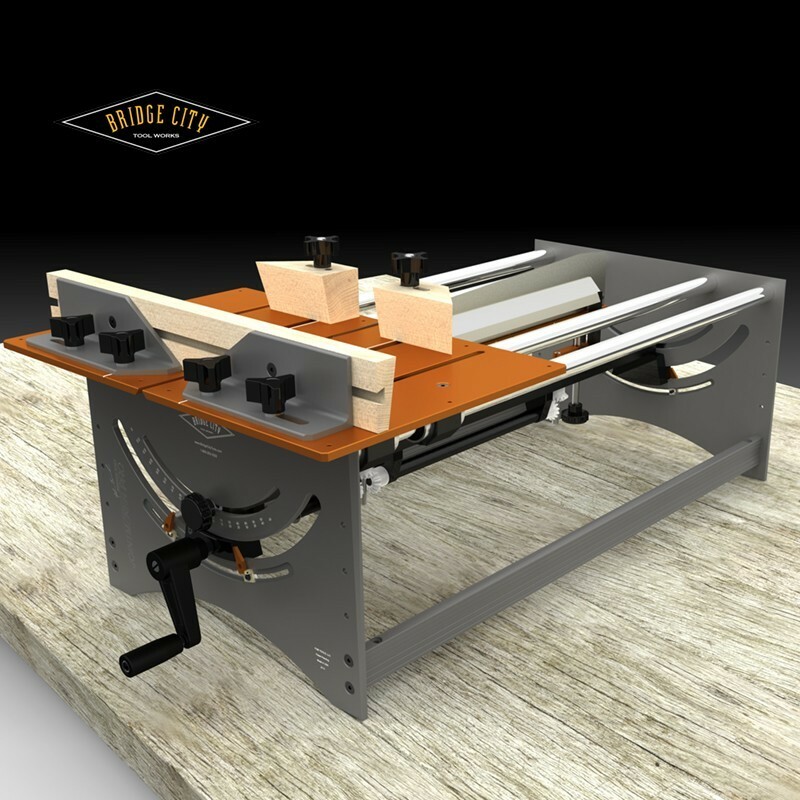 With the Jointmaker Pro v2, your stock is rigidly held on the linear table (there are various methods depending on the type of cut). All you do is provide the easy back-and-forth motion. Between each stroke, you adjust the blade height for the next cut (if necessary). It may sound complex, but after a few practice cuts you’ll find yourself in a rhythm, where all of this happens quickly and without thought. More importantly, the resulting cut is so smooth it is hard to believe—and achieved with very little noise and no electricity. And it is so versatile. 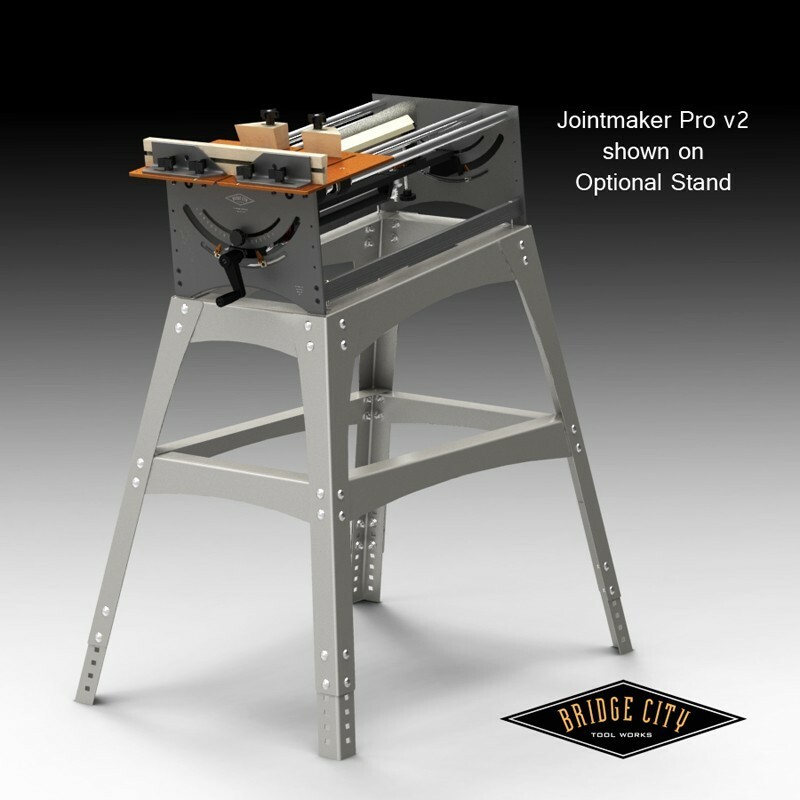 The tables allow for all kinds of shop-built fixtures and accessories as your reliance on the Jointmaker Pro v2 grows. You will find many new ideas and uses for this amazing saw once you get your hands on it. Most hand accidents involving saws are caused by work-holding risks on power equipment. As such, most woodworkers tend to avoid smaller projects because of these risks. 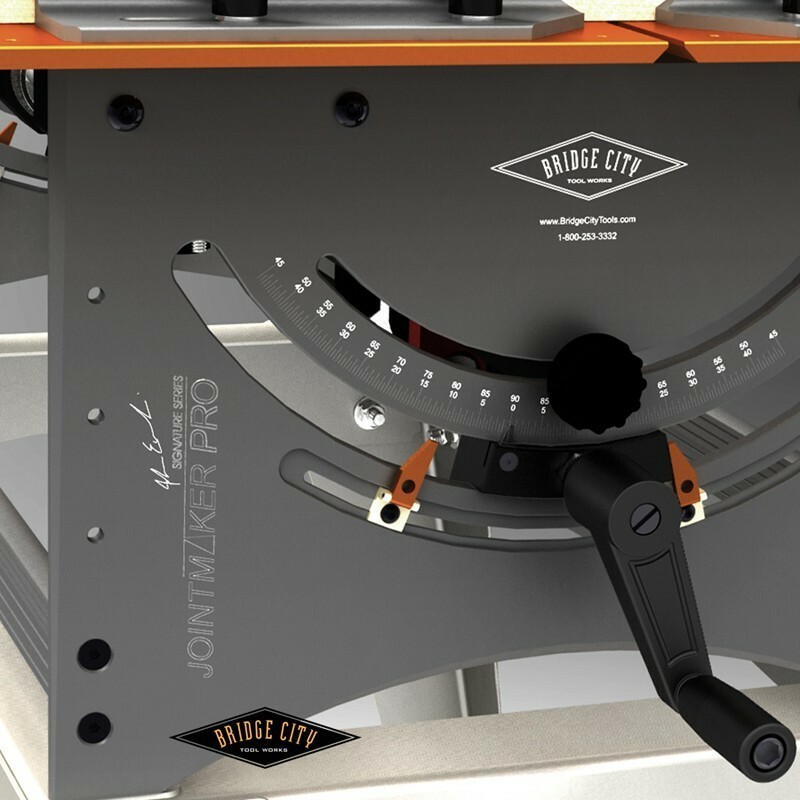 With the Jointmaker Pro v2, the fear of losing digits is all but gone, and the world of making amazingly accurate cuts in small stock is not only easy, it is a whole new aspect of woodworking that is every bit as rich an experience as building larger-scale pieces. There is an old saying, “woodworking gets more difficult the smaller the scale.” And yet the JMP v2 is equally adept at cutting stock up to 6 inches (152.5mm) in width and 1-3/4” (44.5mm) thick. Hardness of the wood does not matter as you adjust the pitch accordingly to allow the saw to cut efficiently with each stroke. The Jointmaker Pro v2 features a linear table design using a recirculating linear bearing system (the bearings follow a closed loop). They do not need adjustment (factory assembled) and they do not require lubrication. The main advantage is they are easier to use (much less friction) at the expense of a bit more noise. The acetyl bearings are much quieter than steel bearings and we are thrilled with the results. The tables feel effortless and are easily used with one hand. The applications and uses for this tool are enormous. The only limit is one’s imagination! NOTE: Due to the size of the JMP, it can only be shipped UPS or Fed EX. USPS will not ship this product.